Mansfield Town manager Steve Evans wished the new regime at struggling neighbours Notts County all the very best, but not before Saturday’s local derby showdown at Meadow Lane (1pm). Evans also said he was still hopeful of bringing in a new face or maybe more before the game. County, who have just lost a club record 10 games on the trot and faced a winding up order from HMRC, today announced a new owner in Alan Hardy and a new manager in Kevin Nolan, which is bound to hugely lift the ailing Magpies just before the derby game. “It’s always good when you see a football club getting a rescue package and someone stepping in,” said Evans. “I don’t know Alan Hardy, but he will be spending his hard-earned money and saving a football club he is a big fan of and loves dearly. “He has appointed Kevin Nolan as manager and we look forward to seeing Kevin on Saturday. He will have his troops ready to go into battle. “From a distance we are rivals on the pitch and supporters will be rivals at 1pm on Saturday, but we wish Alan Hardy every success at Notts County outside the games against Mansfield Town of course. 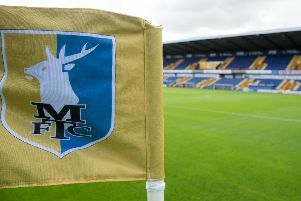 Evans knows the news of a new owner and manager will lift the home fans, but Stags expect to take 3,500 of their own down the A60 and Evans said: “The atmosphere was always going to be great, it’s a local derby. “I have watched Notts County play Mansfield Town on a couple of occasions and it’s always reminded me of every other derby. “It’s just the numbers around the pitch that is the difference. “It is always going to be fiercely competitive, but we have to go there and remind our players that as much as we have to play with out hearts and determination, we have to play with our brains as well. On new boss Nolan, he added: “I expect him to put a team on the pitch and demand a lot from them. “I know one or two of the lads at Leyton Orient who were around when Kevin got a short time as manager there and were really impressed with what he did. “Of course he has a fantastic playing pedigree to build on with his experience. I think he will do well. He is a good appointment as a manager by the chairman and I expect his teams to be competitive. Evans, a Glaswegian, is a huge fan of local derbies – and has a good past record in them. He said: “It is the supporters’ day of the season isn’t it? “I watched Southampton v Liverpool last night, it was a massive cup tie, but there was no rivalry other than them being Premier League clubs. “But you look to the weekend Liverpool go to play Manchester United and there is rivalry. “It’s the same with us. We play a lot of League games and we are passionate about every game that comes – but local derbies are always special. “It gives the fans the good feelings over the weekend and going into work when they see supporters of the other club, that’s always great. On the huge army of followers, he continued: “Our supporters have been great since the day I walked in. “To hear we are going to sell our allocation out and travel there with around 3,500, I feel very fortunate I have managed clubs where the supporters live and breathe their football club. “If we can match the passion of the 3,500 fans as a team then we will take whatever comes in front of us between 1pm and 3pm. With three wins on the trot without conceding a goal, Evans has plenty of competition for places at Meadow Lane. “Everyone will be in fresh and ready tomorrow and doing their best in training to get the nod to be in the starting team on Saturday, or even to be on the bench, as competition is getting stronger,” he said. Centre half Kyle Howkins will miss out with a knee injury, but Evans has plenty of options and hopes he may boost that with a new face or two by the end of today. “Every time we lose one of our key players it’s a little blow, but the other lads who have come in have trained really well,” he said. “We’ll freshen them up and we are still trying to add to the group. It wouldn’t frighten me to add one or two for Saturday. “If we do, as we showed at Blackpool, they will come into play though that doesn’t mean they will start. “I am hopeful of one, maybe two or maybe more, but tomorrow will be too late.